Friedrich Wilhelm Markull was born on February 17, 1816, in Reichenbach near Elbing in the Prussian province of Pomerania. He showed musical promise at an early age, and studied piano and organ with his father, who was organist of St. Annenkirche, Elbing. By the age of nine, Markull was so skilled at leading chorales and playing Vor- und Nachspiele that his father entrusted him with playing complete services. At the same age, he was studying theory, organ and violin at the Gymnasium in Elbing. While playing violin in the school’s orchestra, where he became firmly grounded in Classical form and style, which experience his biographer Neumann asserts inoculated him against “later addiction to the Romantic”. In 1833 he was sent to Dessau where he studied composition and organ at the Friedrich-Schneider-Musikchule, with emphasis on a thorough grounding in the works of J. S. Bach. Already in 1835 Gustav Schilling predicted in his Universal-Lexicon der Tonkunst that Markull would become one of the greatest organists and composers of all time. In 1836 Markull was appointed principal organist of the Marienkirche in Danzig (now modern day Gdańsk in Poland), the largest Lutheran church in the world, with its renowned late Renaissance Dutch organ built by Julius Anthoni Friese. At the same time he became music director of the city’s Gesangverein. In 1842 he assumed additional duties as singing master of the Danzig Gymnasium, and in 1847 the title of Royal Music Director was conferred upon him. During his long tenure with the Gesangverein he performed all the great oratorios of Handel, Haydn, Graun, Mozart, Beethoven, Spohr, Mendelssohn and many others, as well as his own oratorios Johannes der Täufer and Das Gedächtniss der Entschlafenen. (In an interesting aside, sacred music scholar Robin Leaver made a convincing case that Johannes Brahms drew material from Markull’s Das Gedächtniss der Entschlafenen for Ein deutsches Requiem.) He conducted his own works in acclaimed performances in Danzig, Leipzig, Berlin, Königsberg, Erfurt, Riga, Kassel and elsewhere. Markull was also active in chamber music as pianist and violinist, and organized many orchestral concerts in Danzig. He also wrote music criticism for the Danziger Zeitung. In 1886 the city of Danzig honored Markull with great celebrations for his seventieth birthday and for a half century’s dedicated service. 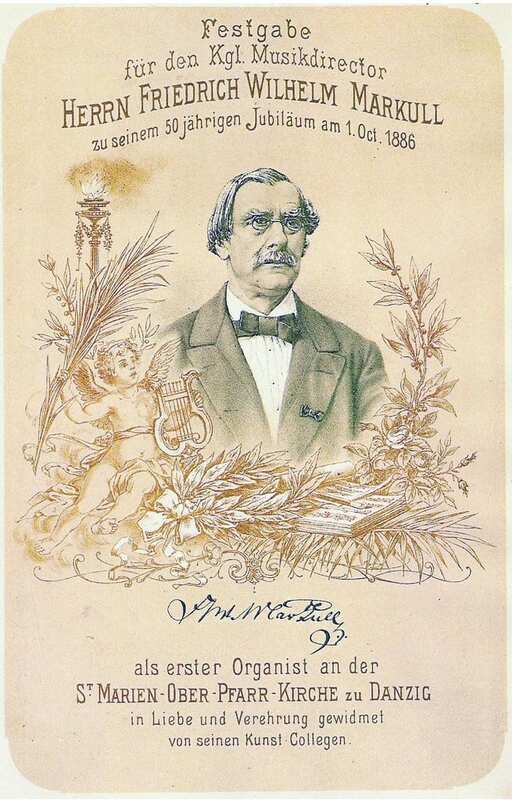 Friedrich Wilhelm Markull died at the age of 71 in Danzig on April 30, 1887. Although sometimes noted as a composer of only local importance, from today’s perspective it is clear that Markull was the most influential nineteenth century musical force in Danzig, and his historical importance cannot be underestimated. Since his death over 120 years ago, only a very few isolated works by this largely forgotten composer have been published in a modern edition. This edition is prepared for use with the Evangelical Lutheran Worship hymnal; with only a few exceptions, Markull’s selection of tunes remains in use today among North American Lutheran congregations. With this new complete edition of Op. 123, we hope to reintroduce Markull’s important music into Lutheran worship, music that remains eminently fresh and useful even for the twenty-first century church musician.